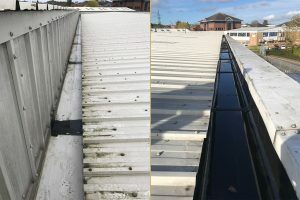 Specialists in commercial property roof repairs through our work with surveyors, pension fund managers, property companies and private landlords, we have developed a diverse range of roofing repair services. As heavy storms or strong winds can often dislodge and damage roof slates and tiles. We carry stocks of slate and the common concrete and clay tile types in order to carry out fast and effective repairs in a timely manner. 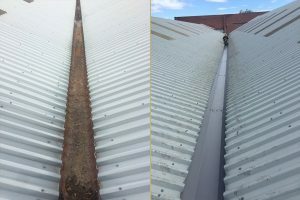 We have extensive experience in cleaning moss and algae from roofs of all types. The build up of moss and algae can lead to blockages in gutter systems and down pipes. 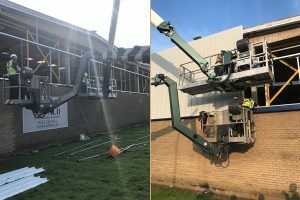 Via our specialist plant and our fleet of access platforms we are equipped to clean all types of roofing coverings. We offer a complete lead flashing repair and replacement service, although we have found that the spiralling costs of metals have led to a huge increase in thefts of lead from building. 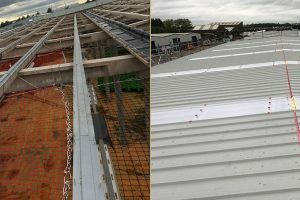 To prevent future thefts we often specify innovative lead free flashing substitute products such as Ubiflex which have no re-sale value as scrap. Ubiflex is a waterproof flashing material which can be used in all applications where lead is traditionally installed. Ubiflex is fully malleable, and can be worked in both directions and is self sealing if punctured. 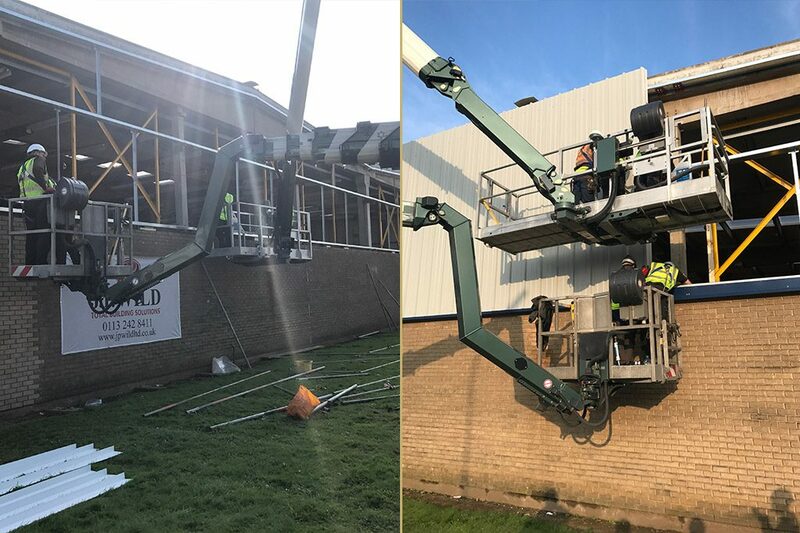 Defective and ageing roof lights can often be the cause of roof leaks; we have vast experience replacing all types of roof lights with the ease of access via our specialist plant and equipment. 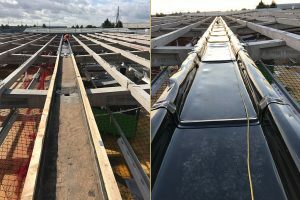 If replacement roof lights are required a survey must be carried out to establish the profile of the sheeting. We are also approved applicators Giromax Delglaze, which is a translucent product applied to existing polycarbonate rooflights to re-coat and re-seal. 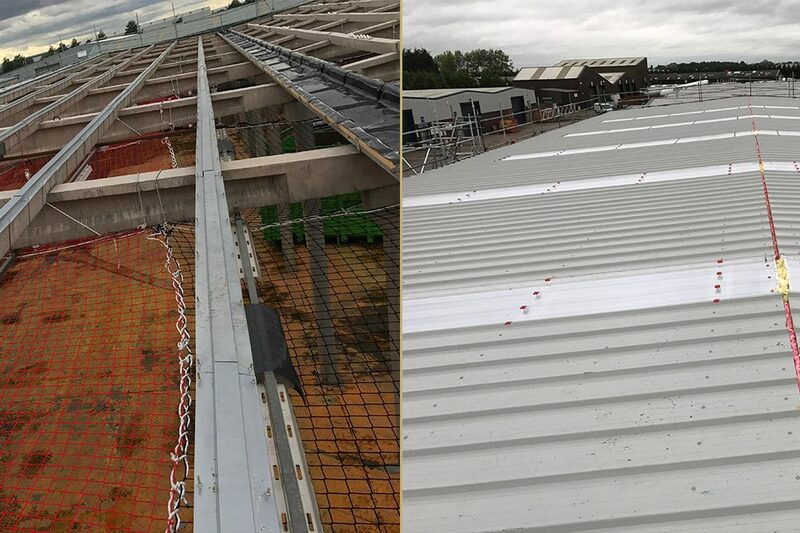 Subject to site location roof sheeting will often require maintenance to extend its life span common problems associated with steel roofing are the delamination of the protective colour coating and corrosion of the steel substrate. 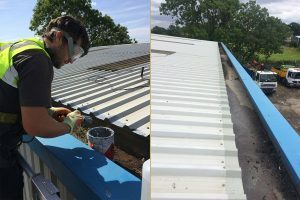 We are trained and approved contractors for Delcote architectural coating system which is ideal for reinstating an effective coating on aged organic coated roof and wall cladding products such as PVC Plastisol, Pvf2 and polyester where a standard two coat 200 micron application will provide protection equal to, or better than the original new product. The surface must be free of dirt, dust and all foreign matter to achieve this we carry out high pressure water jetting to remove any contaminants. We use the same refurbishment and encapsulation processes for vertical cladding systems, cladding can have a serviceable life of up to forty years, although brighter colours can fade quickly and need to be repainted. 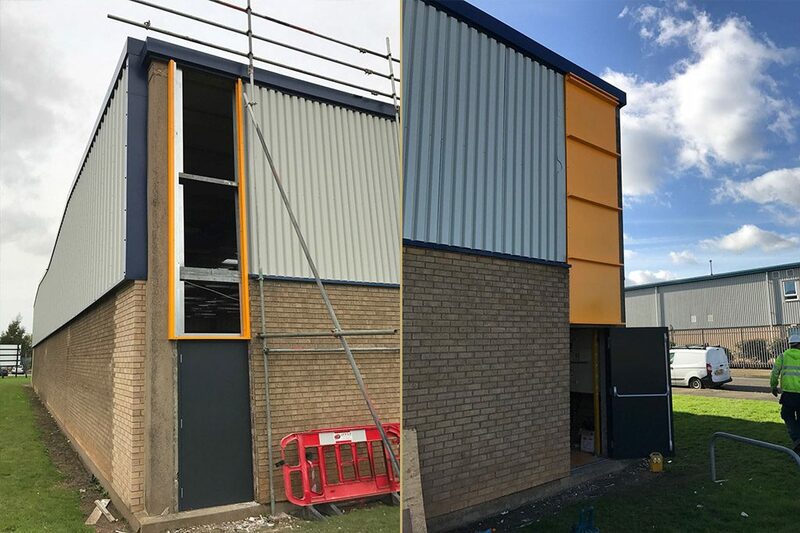 We have the expertise required to give your building a new lease of life whilst providing you with a cost effective solution. Corrosion on a metal sheeting roof can occur when the sheet coating begins to delaminate and peel back due to weathering. 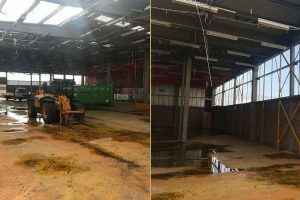 This usually happens where the sheet laps and sheet ends meet and have been cut to size for a specific building. Peel back is an almost inevitable defect on a metal profile roof and is often exempt from guarantee, early detection of peel back and corrosion is therefore vital to avoid costly roof sheet replacement. With immediate access to our fleet of truck mounted access platforms we are able to carry out roof condition surveys at short notice. 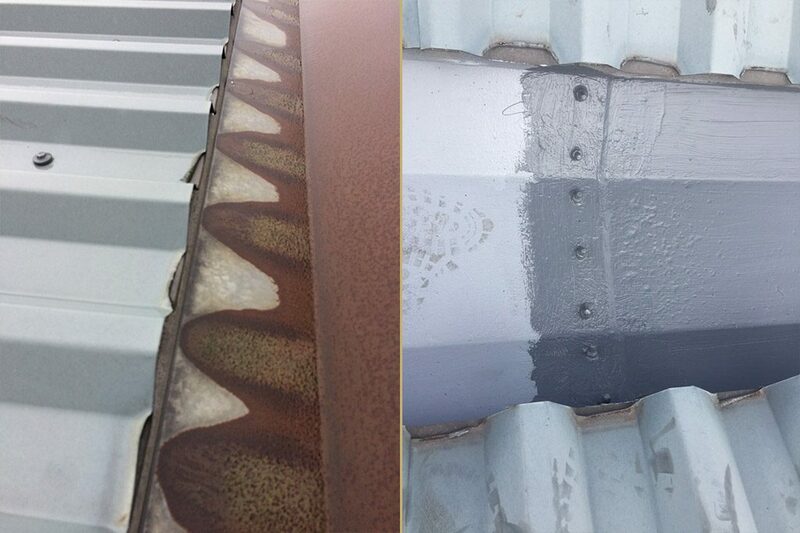 Our reports are accompanied with photographic documentation to establish and record the roofs current condition. 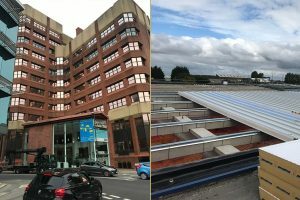 Our survey reports will also list recommended actions to repair, improve and maintain the condition of the roof being surveyed.